The highly competitive Sinquefield Cup is underway in St. Louis. Earlier today, grandmaster Fabiano Caruana won his seventh consecutive match — and he did so against the world champion. Chess pundits are calling the streak a "historical achievement." 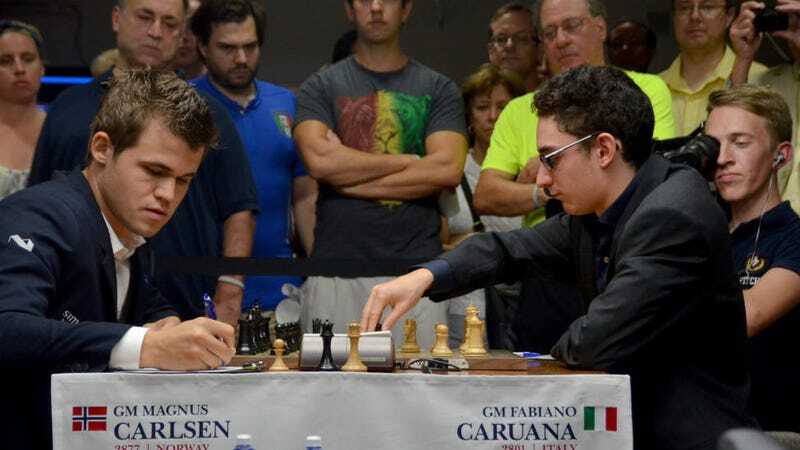 Caruana, who was born in Miami, became a grandmaster at the age of 14, the youngest to do so in the history of both Italy and the United States. Though he's been a world-class chess player for years, his dominance this week at the Sinquefield Cup — a tournament some consider to be the world's most competitive — has been unprecedented. He currently sits at seven wins, zero losses, and one draw. There's two days left in the tournament, but he's already clinched victory. The tournament features six players, including 23-year-old Magnus Carlsen, the Norwegian reigning World Champion and highest-rated player on Earth. Earlier today, Caruana destroyed Carlsen in 34 moves. Caruana's seven-game streak deserves a place in history. It wasn't just an undefeated streak, it was a winning streak — no games were lost or drawn. (And Caruana won the two games he played before the Sinquefield Cup.) According to Chess.com, Wilhelm Steinitz, the first undisputed World Champion, won 25 consecutive games from 1873 to 1882. The American World Champion Bobby Fischer won 20 games against top competition in the 1970s. However, while it's difficult to compare the strength of chess players over time, it's likely that the strength of Caruana's opponents is considerably higher than that of Fischer's 40 years ago or of Steinitz's 130 years ago. During Chess24.com's coverage of the event's eighth game, grandmaster Ben Finegold compared Caruana's run to others by greats Anatoly Karpov and Mikhail Tal. "This is by far the most impressive to me," he said. "You can't go 7-0. This is like the impossible happening right before our eyes." Aronian, the world's No. 2, added, "That's amazing. I think that's a historical achievement for anybody." Caruna isn't contending for Carlsen's world title this year. That challenge will go to 44-year-old Viswanathan Anand who's ranked fifth in the world. But given Caruna's recent achievement, it'll only be a matter of time before the two duel for the title.